John Beckett recently wrote a blog which tangentially touched on two things I want to expand on here: the way neopagans Romanticize the world of Fairy and experiencing a place in Fairy that seemed much like modern America. I think that both of these points deserve some discussion and that they tie together so it makes sense to tackle them together. I do want to preface this by saying that while I can and usually do to some degree point out textual evidence to support my points* in this case going to be discussing my own personal experiences or what people in this context would describe as UPG (unverified personal gnosis). I tend not to talk much about this aspect of my practice for my own reasons but I think in this case it is necessary to some degree. People are, as always, free to either accept what I am saying or not but I would encourage skeptical readers to at least consider what I am saying. Certainly my experiences are no more or less valuable as anecdotal evidence than what is found anywhere else, I think. It is true that modern pagans seem prone to describing and viewing Fairy through a primitive lens. When people talk about experiences there they are usually couched in terms of wilderness and wild places or occasionally of settings that may be described as historic such as castles or cottages. And that is not to say that these places can't be found in Fairy just as we can find these places in our own world, because they certainly do exist both here and there. But there is a definite and noticeable favoring of the sorts of Otherworldly scenery that correlates with the places in our own world people tend to say we are most likely to find Themselves as well. Many pagans talk of Fairy as if it were one vast forest or Europe stuck in medieval times. There's a couple problems with that in my opinion that are worth addressing. First of all I'm always wary of anything that narrows our understanding of Fairy rather than expanding it. The more restricted any view of the Otherworld is the quicker we will be faced with unmanageable contradictions. Secondly this is problematic because when we look at the evidence we do have from folklore and earlier anecdotal evidence we find that by and large people who went into Fairy found it to include not only the aforementioned wilderness but also cities, and usually the places people visited were either much like the ones on earth or similar to what had existed within living memory. Or put another way people discussing going to Fairy a hundred years ago weren't usually seeing medieval villages* but rather described places just like they had left on earth or places reminiscent of their grandparents or great-grandparents times. This is also what we generally see in descriptions of clothing, with the Good People being described as wearing either contemporary fashions or those a generation or two out of date*. So I do think that the wider community would do well to seriously re-assess how Fairy is being imagined and why, and consider broadening horizons. Now for myself a large part of my personal practice is predicated on Journeying or being taken in trance or dreams to Fairy. I haven't spoken too much about this because by and large these are personal experiences and I don't think sharing them is necessary or adds value to the wider dialogue. However in this case I'd like to share a few instances where places were visited that were neither wild nor primitive. There is a place I have been to on several occasions which I think of as a kind of 'Grand Central Station' although there are no trains there. It is a multi-level building, stone with a lot of brass or bronze fixtures and what seem to be electric lights, with large archways that lead off from a main area. There are clocks everywhere and glass windows. It seems to act as a transfer point where people can choose their destination and then pass through an archway to find the road that will take them there. I have stayed in a place that is very much like a small modern house, with running water, indoor plumbing, and a functional kitchen. The only thing that wasn't entirely modern was that it was heated by a fireplace. Otherwise though, what acted at least like electric lights, a stove and refrigerator, all the usual comforts. Several cities in the Otherworld that I have experienced seem distinctly modern, with paved roads, traffic lights, and a mix of residential, entertainment, and business areas. None of these are uniform but like places on earth they each have their own personality - one reminded me a bit of some older New England cities where the buildings seemed older than the overall energy of the place, while another was very sleek and modern and had a very rushed feel to it as if everything was in motion. Not to disabuse anyone's idealized ideas of what Fairy might be but these were not perfect versions of cities either, they had some shady looking beings (not unique to cities by any means) hanging around, there was rubbish in the streets and by the buildings, and one consisted of nothing but one way streets. I have of course also been to places that were wilderness, and places that reminded me of human habitations from various time periods - but then again I've been to the same variety of places in this world as well. I know some people feel that whatever we see or experience in Fairy reflects our own expectations but I disagree; I have often seen things I didn't understand and so couldn't reflect an expectation and sometimes have pointedly not gotten what I expected. I rather loathe cities myself and if I were to expect one in Fairy I would probably imagine it either as an ideal small city or some sort of perfect past vision of an early modern city and that is definitely not what I have experienced. I will also admit that I haven't seen anything resembling cars myself in the places I've been even though I would expect them in settings that seem so modern but I have seen a lot of metal work in bronze and various alloys. I also haven't seen any guns. That isn't to say there aren't any motor vehicles or modern weapons there, just that I haven't personally experienced them. I suspect that our relationship with the world of Fairy and the relationship of its inhabitants with us is far more intrinsic and symbiotic than we realize. Perhaps the way that time moves differently between us affects our perceptions of this but it seems clear that there is a mimicry that occurs either intentionally or coincidentally, or even because of the influx of humans to Fairy. Perhaps it comes from their own observations and visits among us in this world. It is safe to assume I think that this pattern which has occured across folklore into the 20th century is not about to stop now. What my experiences have convinced me of is that Fairy is a stunningly diverse place and we shouldn't underestimate that. Not Fairyland. 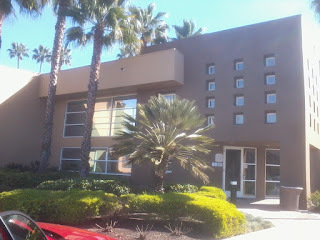 A hotel in California. But hey I needed an image so here we are. *of course there are some exceptions, but again we can find places in our own world that reflect various historical time periods as well. *let us all take a moment to appreciate the idea of one of the Gentry appearing today in bell bottoms and tie dye, or a poodle skirt. Good posting - lots to consider here.